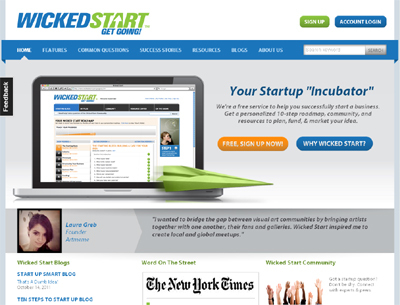 Wicked Start is free online incubator that helps anyone starting a business navigate the business startup process, with a customized 10-step roadmap, a community of experts and peers, and access to resources to help plan, incorporate, fund and market their new businesses. We offer a proprietary 10-step startup process that enables users to set up a personalized startup checklist for their business, monitor and and check off their progress, locate resources and service providers that would be useful at every step (including special deal) — and last but not upload and organize all of their startup documents online. They can also get feedback on their startup, or get their questions answered for free, from our community of experts and peers.